PT Transportasi Jakarta - PT TJ or referred to as "Transjakarta" is a reputable transportation services company based in Jakarta. Transjakarta operates primarily an operating company of Transjakarta, a Bus Rapid Transit (BRT) system in the Greater Jakarta. Transjakarta - or known as Busway - is recognized as the first BRT system in the South East Asia and South Asia Regions. Transjakarta is the flagship program of the Provincial Government of DKI Jakarta Province to the development of public transport based on bus. According to information found in the Company's website as cited by JobsCDC,com, Transjakarta was officially established on 15 January 2004 to provide a fast public transportation system to Jakarta citizens to help reduce rush hour traffic in Jakarta. The buses run in dedicated lanes and ticket prices are subsidized by the regional government of Jakarta. Transjakarta is designed based on a successful Transmilenio system in Bogota, Colombia. 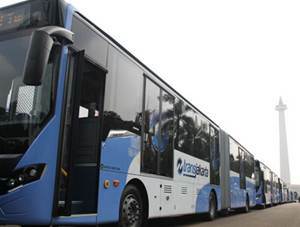 Transjakarta has a total passage of 208 km and recognized as the longest passage in the world. Transjakarta now has 228 stops scattered in 12 corridor (primary routes) and 10 cross-corridor routes. Age 30 to 35 years old. S1 / S2 from reputable University majoring in Law. Minimum 5 years of experience in Company legal. Advanced knowledge about legal aspects of the agreement and legal aspects of the company. Able to work in a tight schedule. Have good spoken and written English skills. Age 35 to 35 years old. S1 from reputable University majoring in Engineering, Law, Economics. Familiar with procurement system in the government / BUMD / BUMN. Minimum age of 27 years and maximum 45 years old. Possess driving license, minimum class B1 Umum (SIM B1 Umum). Have good integrity and discipline. Have a good responsive about the problems in the vehicle. Minimum age of 21 years and maximum 30years old. Minimum height of 165 cm for Male and 160 cm for Female (ideal body weight). Education minimum SMA - D3. Responsive to the situation on the bus. Willing to be placed throughout corridor of Transjakarta. D3 / S1, preferably in the field of IT. Have solid understanding about SQL server and WEB-based programming language. Preferably have good understanding about the rules of HRD and employee taxes. D3 / S1 in any field. Preferably have good understanding about finger print hardware. Have minimum 5 years of experience for heavy equipment vehicle (BUS, TRUCK). Technical experience in handling Chinese and European Buses. Advanced knowledge about spare part. JobsCDC.com now available on android device. Download now on Google Play here. Please be aware of recruitment fraud. The entire stage of this selection process is free of charge. PT Transportasi Jakarta - SMA, SMK, D3, S1, S2 Staff Transjakarta January 2018 will never ask for fees or upfront payments for any purposes during the recruitment process such as transportation and accommodation.